If the Keurig coffee maker has caught your attention, this page will give some final details that you might be interested in should you decide that the single cup coffee machine is perfect for your family. The coffee lovers who invented the Keurig Coffee Maker always thought that a cup of coffee should be fresh, hot, and individual. They noticed that a lot of coffee was thrown out because coffee lovers prefer a fresh cup of their favorite drink each time they indulge. Therefore, they developed the concept of a Single Cup Coffee Maker. Keurig took their idea and developed it for both home and office use. Since 1998, you can brew a single cup of coffee in less than minute wherever you are. The guesswork and mess of grinding the coffee beans, putting the coffee into filters and filters into percolators or drip machines may soon be a thing of the past because of this technology. Derived from the Dutch word for excellence, Keurig promises excellence in their products. Not content to stick to just a few tried and true blends of coffee, today there are over 150 K-Cups to satisfy coffee, tea, and hot chocolate drinkers in the world. And, if on of these is not your favorite, there is a K-Cup designed so that you can add your own favorite blend each time you want a cup of coffee. Caring for your Keurig one cup coffee maker is a breeze. Since the filters and the coffee is already well contained in environmentally friendly, kosher K-Cups, the only cleaning you have to worry about are a few drips and splatters on the removable drip tray. The water tanks are removable and can be washed, if needed, with mild detergent. Sometimes, you will need to descale the machine. There is a cleaning product particularly for this and the indicator light on the machine even tells you when to do it. You can purchase the home models of the Keurig Coffee Machine online or at various department stores. To make the purchase an easy decision to make, Keurig coffee maker comes with a 30 day refund, so if you are not satisfied with your Coffee Machine. Simply call their toll-free number to find out how best to return it in your area. 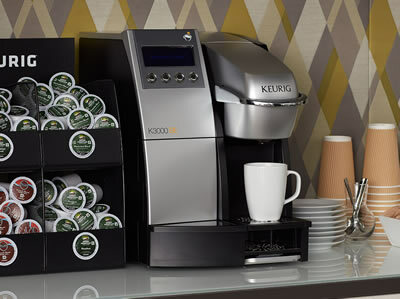 If you would like to purchase a commercial model for your office, get in touch with the Keurig dealers online and someone will call you back with all the information you need to insure that the staff in your office is well-satisfied with their coffee choices. Purchasing the Keurig K-Cups is a simple matter, as well. They, also, are available online with many companies offering variety packs and special deals. Retailers also carry the Keurig line of products for your convenience. One thing that you might consider, however, is the fact that the keurig coffee makers are built to take only the K-Cup. There are several types of coffee machines on the market that have engineered specific products to fit only their machines. This is the case with Keurig as with others who have developed single serve coffee products. The most notable achievement, of course, for the Keurig name is the single serve coffee, tea, and hot chocolate that makes a perfect cup of your favorite hot beverage in less than a minute. No more throwing out the old coffee or waiting till the pot is empty so you can sneak in your favorite brew when the rest of the household isn’t looking. On the down side, the Keurig B40, Keurig B50, and Keurig B60 have little trouble with being a noisy coffee machine. The Keurig B70 household model has corrected some of that noise and the water reservoir is larger, as well. Of course, the keurig B40 coffee maker is the little brother and has a few less amenities, such as the digital clock as well as a smaller reservoir for water. However, the reviewers for this machine welcomed the change that provided individual coffees without the “old” coffee syndrome. As the home models increase in price, the cup size option and “consumer” perks increase as well but either way, the coffee blends are just what the customers ordered. 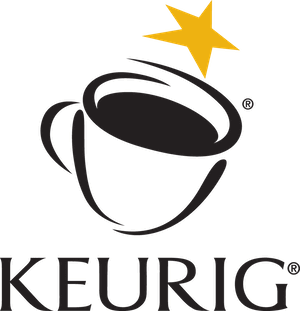 Most notably for the commercial coffee makers from keurig, reviews hailed the individualized cups of coffee a great asset to their work environment. The larger models of Keurig coffee machines – keurig B200 and Keurig B3000, offer the convenience of hooking up to the water supply which is a great convenience for the larger number of cups of coffee brewed. All in all, for the money, the Keurig coffee maker provides a variety and convenience as well as fresh hot drinks for the most discerning of customers.With a 30 day money-back guarantee, what more could the coffee drinker ask for in his or her search for the perfect cup of coffee. Keurig B70 coffee maker,read review of this popular single serve coffee maker from Keurig. The Keurig B40 Single Cup Brewer is a terrific machine for those people who want quality, but at an affordable price. Read what the Keurig B40 has to offer its users. “Keurig” comes from the Dutch word for ?excellence? and that is what they strive to put into all of their coffee makers. The Keurig B100 is no exception. The Keurig B30 mini brewers come in a size small enough to fit in a tote bag, making it easy to carry to almost any place. Read review of this personal coffee maker from Keurig. One cup coffee within a minute, that is what a Keurig single cup coffee maker has to offer you. 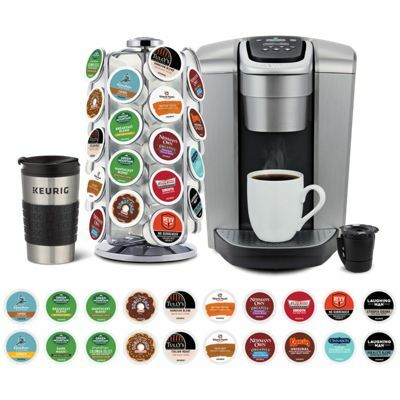 Weather you are looking for a keurig K-cup coffee, tea or hot chocolate. Read all about K-cups in this article. Which keurig coffee machine is well suited for your office depends on your requirements – how many people……access to water supply…..Do you need a coffee vending machine?